Thanks to improved spin-orbit interaction in silicon, quantum bits are at present easier to exploit for devices in quantum computing. A silicon quantum computer chip possesses the potential to hold numerous quantum bits (or qubits), for a lot faster information processing than with the bits of present-day computers. This translates to high-speed database searches, improved cybersecurity, and extremely efficient simulation of materials and chemical processes. Recently, research teams from Purdue University, the Technological University of Delft, Netherlands and the University of Wisconsin-Madison have discovered that silicon has exceptional spin-orbit interactions that can enable the controlling of qubits using electric fields, without the use for any artificial agents. Qubits encoded in the spins of electrons are especially long-lived in silicon, but they are difficult to control by electric fields. Spin-orbit interaction is an important knob for the design of qubits that was thought to be small in this material, traditionally. The strength of spin-orbit interaction, which is the interaction of an electron's spin with its motion, is a crucial factor for the value of a qubit. 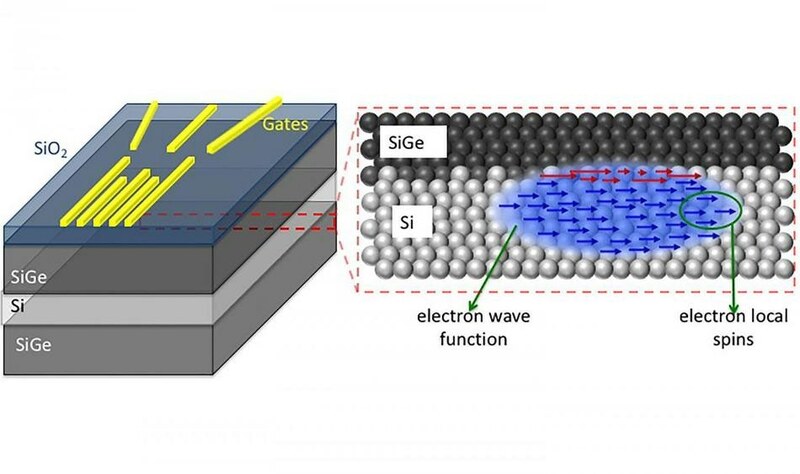 The scientists found more noticeable spin-orbit interaction than normal at the surface of silicon where qubits are situated in the form of so-called quantum dots — electrons restricted within three dimensions. Rahman's lab recognized that this spin-orbit interaction is anisotropic in nature — meaning that it is reliant on the angle of an external magnetic field — and intensely affected by atomic details of the surface. "This anisotropy can be employed to either enhance or minimize the strength of the spin-orbit interaction," said Rifat Ferdous, lead author of this study and a Purdue graduate research assistant in electrical and computer engineering. Spin-orbit interaction then influences the qubits. "If there is a strong spin-orbit interaction, the qubit's lifetime is shorter but you can manipulate it more easily. The opposite happens with a weak spin-orbit interaction: The qubit's lifetime is longer, but manipulation is more difficult," Rahman said. The scientists reported their findings in the June 5th issue of the Nature Partner Journals — Quantum Information. The Wisconsin-Madison team fabricated the silicon device, the Delft team conducted the experiments, and the Purdue team guided the theoretical investigation of the experimental observations. This study is supported by the Army Research Office, U.S. Department of Energy, the National Science Foundation and the European Research Council. Future work in Rahman's lab will concentrate on exploiting the anisotropic nature of spin-orbit interactions to additionally improve the coherence and control of qubits, and, consequently, the scaling up of quantum computer chips.